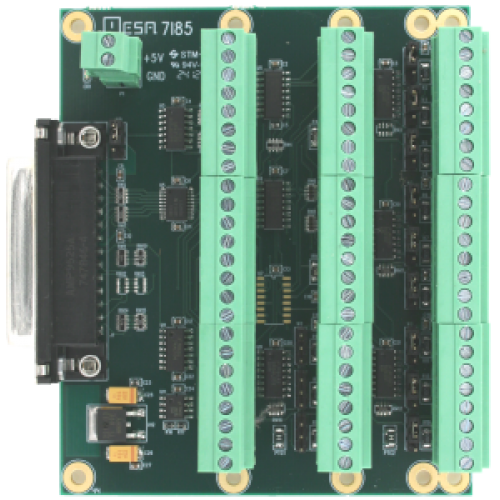 The 7I85 is a five channel RS-422 serial plus four channel encoder interface for Mesa's Anything I/O series of FPGA interface cards. The 7I85 is designed for motion control applications. A common usage of the 7I85 would be connecting up to four serially interfaced drives to four of the 7I85's five full duplex RS-422 interfaces and up to four encoders with index to the 7I85s encoder inputs. Encoder inputs can be TTL or differential on a per input basis. The 7I85 can also supply 5V power to encoders. 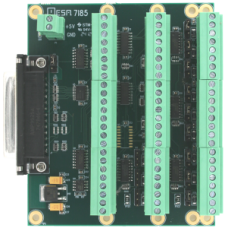 A 7I85S version is available that replaces four of the serial interfaces with 8 differential ouputs that can be used as four differential step+ dir output pairs or PWM outputs or other output functions. The controller connection is a DB25 connector that matches the pinout of Mesa's 25 pin Anything I/O cards. All buffered I/O is terminated with 3.5 mm pluggable screw terminals (supplied).